Watsonville, CA - The 2009 edition of the Santa Cruz County Fair earned over 20 awards for excellence at the 2010 Western Fairs Association (WFA) convention. In fact the Fair ranked with some of the biggest fairs in the west when it came to earning accolades for innovative programs and community outreach. The Fair received first place recognition for the 2009 Agricultural Program as well as Best Single Day and Competitive Exhibits Promotion. The Fair also was tops in the categories of Entry Form, Exhibit Display Props or Methods, Our Best New Idea This Year - Exhibits, Our Best New Idea This Year - Maintenance, and Vendor Packet. Marketing, including a very strong effort in the use of social media, was honored including a first place for Display Newspaper Advertising, Single Ad. "There are a lot of good ideas that start with fairs our size" said deputy fair manger John Scurfield. Scurfield helped organize the various departments and help them put together the entries submitted last fall to the WFA judging committee. "It's nice to be able to present good ideas that others can use and in return take innovation from others and apply it to our Fair" added Scurfield. This exchange of ideas is at the core of why county fairs sprung up in the latter part of the 19th century. Retiring fair manager John Kegebein reminded all that "It was farmers and ranchers coming together to take a look at new machinery and hear about the latest ideas that started the whole fair movement." Expect to see last year's award winning ideas expanded and a few new twists at the 2010 Fair. Or as board president Stuart Yamamoto explained "After all, we have an award winning reputation to uphold!" The Santa Cruz County Fair celebrates the rich history of the community and people and invests heavily in bringing this heritage to area youth. 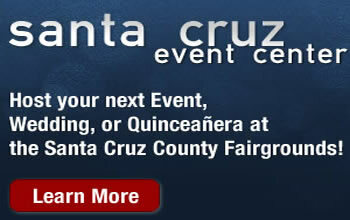 The 2010 Fair will be held September 14-19 at the Fairgrounds located on Highway 152 just east of Watsonville. This year's theme is "Apple Pies and Family Ties."